Next January 28th, I step down as Commander of the San Jose Council of Kadosh. 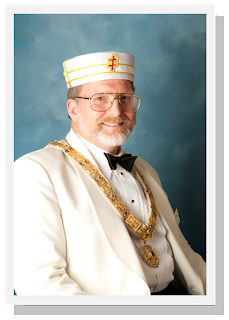 And also finish a term of 15 years in the Scottish Rite officer lines, where I also served as Venerable Master and Master of Kadosh. Becoming Venerable Master filled me with great anxiety...the other two, not so much. How well I served is for you to judge. I witnessed many good examples along the way. I did what I could to emulate them. And I enjoyed excellent support along the way. For those gifts, I thank you, my brothers, those living and those called home. I remember when the Consistory line had nine offices. Then we reduced the number of offices to five per body. And I recall when we added duties for the lower officers, who simply waited for their turn to sit in the East. Today the bodies take turns opening and closing Stated Meetings and hosting at the dinners. Those changes have increased both enthusiasm and participation. The meetings start right on time, too. If you are on the wrong side of the door, you must wait to enter. The Lodge of Perfection conducts business for all four Scottish Rite bodies and supports the ineffable degrees (4 thru 14). The Chapter of Rose Croix provides the Maundy Thursday service and supports the religious and ethical degrees (15 thru 18). The Council of Kadosh supports the chivalric and philosophical degrees (19 thru 30). And the Consistory supports the capstone degrees (31 and 32). While the bodies each support a specific set of degrees, the officers and members of those bodies participate in all of the degree conferrals and communications. So what does it mean to support degrees? Because Freemasonry is, among other things, a fraternal order, there must be an organization to support what Freemasons do. Some people are shocked to hear the purpose of a Masonic Lodge is to make Master Masons. Once, when I made that comment, an old timer exclaimed, "BU****IT!" Then I got a lecture about community evolvement and charitable giving. Yet those are the same things any worthwhile social organization does. We are not just another social organization, however. There are many self-made men. You might be one of them. But there are no self-made Masons. You are not one of those. A man cannot confer a Masonic degree upon himself. That job requires a degree team… and a Lodge to join. And hopefully a generous collection of sideliners to watch the ceremonies and demonstrate their support of new member. Think of Freemasonry as a package deal. With that idea in mind, we wonder why Lodges and other Masonic groups confer degrees and orders on many candidates but only a few of those candidates become active. We have all heard it, and said it, "We brought in five men this year. Where are they? What happened to them?" In some cases, something happened or failed to happen leaving the new member disappointed and unmotivated. But in the majority of cases, the new members simply have other things to do. Job and family are frequently mentioned as reasons for not attending Lodge. Or for showing up late. That is not so much a problem as it is a circumstance. Consider: You have a Mason, instructed in Masonic teachings, contributing to the work environment. Or you have a Mason, influenced by Masonic values, raising the next generation. Are those not good things? Should Masonry not benefit a man in all aspects of his life? Are these things not the object of our support?